Teeth, formed by nature, appear in the most beautiful morphologies. Among thousand models and with meticulous accuracy I’ve selected these 10 marvels, which I would now like to share with you. We’ve made 10 books and we’ve implemented all teeth into the CAD/CAM software. The tooth templates by Zirkonzahn derive from natural and generic tooth morphologies. The Heroes Collection includes additional tooth libraries with natural tooth morphologies. 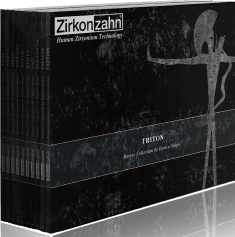 The Heroes Collection virtual and intelligent tooth library, which is newly implemented in the Zirkonzahn software, offers 10 natural and aesthetically pleasing tooth sets, each suiting perfectly the different facial features. The library results from an extremely careful selection process – Enrico Steger personally picked with meticulous precision the most beautiful natural upper and lower jaws for different physiognomies. In the process not only the anterior teeth were considered – also every single posterior tooth was reviewed in terms of its aesthetical properties and transferred into the software. The prerequisite for the software to perspectively and automatically bring into occlusion the upper and lower jaw is the selection of naturally fitting upper and lower jaws. This means that in the future, entire libraries can be positioned in occlusion in the mouth when working with upper or lower jaw restorations. In general it is not necessary to adopt a library’s tooth without modification, especially when there is still natural tooth substance left which is to be preserved and if, for example, only the occlusal surface of the tooth is abraded. In such cases, the preserved tooth substance can be combined with the library’s teeth via the virtual situation model. 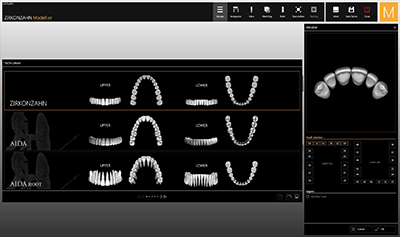 If the tooth library is combined with the 3D facial scanner Face Hunter or the Software-Module CAD/CAM Reality Mode, patients and dentists can get a preview of the final result. This is especially useful when the dentist and the patient are not in the “immediate vicinity” of the technician. Please note that the document can only be opened with Acrobat Reader (version 10 and newer). Download and save the document before opening it with Acrobat Reader.